If you are looking for a new Blu Ray player today is your lucky day! 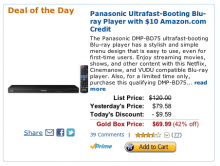 Today’s Gold Box deal on Amazon.com is a Panasonic Blu Ray Player for just $69.99! Plus they are giving a FREE $10 Amazon.com credit when you make your purchase today. Amazon.com has a lot of great â€œLightning Dealsâ€ going on during the holidays. These “Lightning Deals” are sold at limited quantity and only available for a three hours block of time. You can look ahead and get an idea of what they’ll have but you never know until the release. My husband bought me a Kindle last Christmas and I love it! If you know someone who has or is getting a Kindle this year, check out these accessories stating at only $11.99. You can still get free shipping too. Order today and it will be here tomorrow! You can get the Nintendo DSi for $149.99 Plus a bonus offer of a $30 Amazon.com credit! Finally a price I can deal with! Get the Flip MinoHD, Amazon’s Deal of the Day, for $149 with FREE One-Day Shipping. The new Flip MinoHD is now available for only $149, almost 35% off its list price and is eligible to ship with FREE One-Day Shipping. This one is going to disappear fast! Even I bought one! For more information head over to Amazon.com here. Offers Dec 18, 2010 in Amazon, Electronics, holiday · Expired! I can’t say enough about the Flip Video Camera. We’ve had ours for three years and it wasn’t until my daughter got ahold of it that it broke. I won’t even dig out our big camera anymore. I’m really hoping Santa is good to me this year and brings me a new one! Amazon has a great deal on the Flip UltraHD and you even get a $25 Gift Card with purchase! This is the newest model for $179 and then you get the $25 gift card! Check it out, it’s really a great deal! Don’t forget, FREE shipping with Amazon Prime or Amazon MOM! Amazon currently has the Canon 14.1 MP digital camera on sale for just $149.00 (regularly $229) . You’ll also get a free $25 Amazon gift card. You will need to add both of them to your shopping cart. The price of the gift card is deducted at check-out! You can get this in either black or orange. Click the link below to head over to Amazon.com to see this deal and more! Right now Amazon.com has a great deal going on if you buy a Flip UltraHD. Buy an All-New Flip UltraHD video camera, get a $20 Amazon.com gift card FREE! iPod touch 8 GB (4th Generation) $199.99 + Free $25 Amazon Giftcard! Head on over to Amazon to grab this Apple iPod touch 8 GB (4th Generation) NEWEST MODEL for only $199.99 + FREE $25 Amazon Giftcard! Add both to your cart and the $25 giftcard will be FREE! If you even think you want this deal, grab it now. Amazon prices tend to change quickly!